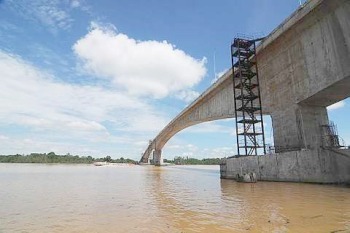 SIBU: Malaysia’s longest bridge across a river, the 1.24km Lebaan Bridge spanning Sungai Lebaan, a tributary of the Rajang River, about 35km from here, will be ready by the end of the month. The bridge will link Sibu to Tanjung Manis at the Rajang River mouth in Mukah Division via the new 80km Sibu-Tanjung Manis Highway. There are seven other smaller bridges along the highway which are scheduled for completion in the next two to three months. Once the highway opens, it will take less than an hour to travel by car from Sibu to Tanjung Manis. At the moment, the Rajang River is the only means of transport between Sibu and Tanjung Manis. Cons­truction of the bridge began in April 2006. The RM222 million project was awarded to Trans Resources Corporation Sdn Bhd (TRC) and the main contractor is Shin Yang Sdn Bhd. The Lebaan Bridge is 11.5m wide with two traffic lanes of 3.6m width each. Water navigational clearance is 110m high and 20m wide. The road and bridges will provide an important link between Sibu and Sarawak’s central coastal regions from Tanjung Manis to Belawai, Igan, and Mukah. The central region hub is expected to benefit from increased business and development opportunities especially from projects implemented in the Sarawak Corridor of Renewable Energy (SCORE). The road will also open up vast hinterland suitable for large-scale agriculture, fisheries and manufacturing industries.